Microsoft's current range of Surface tablet convertible devices concentrate on the premium end of the market. The current Surface Pro starts at £799 (US$799) for the Intel Core m3 model with HD Graphics 615, 4GB of RAM, and 128GB SSD. Configurations cost as much as £2,699 (again dollar equivalence) for a device kitted out with an i7 chip packing Iris graphics, 16GB of RAM, 1TB SSD. Now Redmond is looking for a hit in the cheaper end of the market to compete with Apple's iPad and iPad Pro devices. Microsoft has previously produced cheaper / smaller Surface tablets like the RT devices and the Atom-powered Surface 3 and now it has decided to try again, reports Bloomberg. The report says that the new cheaper Surface devices will sport a 10-inch screen and feature Intel processors and graphics. Aiming for the cheaper sets, it would not be surprising to see Microsoft spec an Intel Celeron or Pentium chip but it is possible with could go with an m3 or i3 too. Other interesting nuggets shared by the source include the suggestion that the new smaller Surface tablets will come with a refreshed design with more rounded corners. 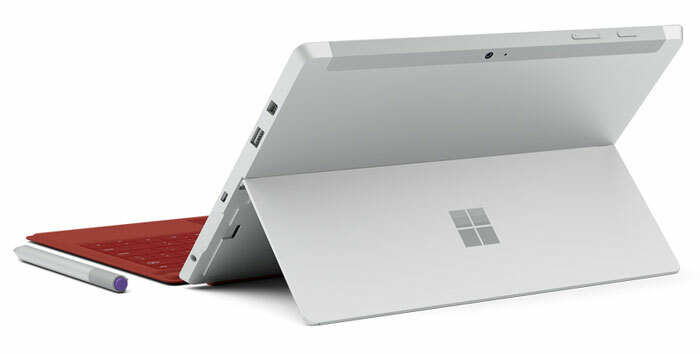 They are expected to be equipped with USB Type-C connectors for data and charging duties, which is a first for Surface tablets. Thanks to their smaller form factor the new Surface tablets will be about 20 per cent lighter than a Surface Pro. However, the bad news is that battery life will be approx four hours shorter. As the current Surface Pro can last approx 13.5 hours on a charge, it sounds like Microsoft is aiming for a 10 hour standard for the new devices. The new tablets will ship with Windows 10 Pro installed. Looking at the competitive landscape; Microsoft sold approx 725,000 tablets in Q1 2018 while Apple has sold an average 11 million iPads per quarter over the last year. Surface tablet sales were up 1.8 per cent in the most recent quarter and the entire Surface hardware business brought in $4.4 billion over the last year. Meanwhile, the third big competitor in this space, Google, is continuing to refine its ChromeOS offerings with touch friendly 2-in-1s which can run Android apps. Just put a proper SSD in it. MMC stuff is useless. Make it a smaller pro, rather than specifically a cheaper/slower thing. It's an interesting decision from Microsoft - I don't disagree that a cheaper surface would be a great addition to the lineup, however the Surface line does not in any way compete with the iPad/Pro.. The iPad pro is purely a tablet, running a phone/tablet OS, designed for consumption and in no way functions as as laptop, whereas the Surface Pro is a true 2-in-1 which is really a laptop first, tablet second. The price comparison that people often try and make is rather incorrect too when you compare base models. The equivalent surface/iPad pro are usually the same price, or the surface comes out slightly cheaper. Obviously that is skewed a little by the fact that the surface is *always* on offer somewhere, whereas Apple rarely allow discounts more than 5% (ignoring grey market scammers like eGlobalCentral et al), but even at full price the price gap is minimal. The iPad pro is still a pretty pointless device that doesn't fit into any common category - it's too expensive to be a tablet, lacks the software to make it a useful laptop replacement..its just odd. The ”normal" iPad is a much better proposition and is a great device. I own an iPad Air 2 and thats still my main consumption device, but my Surface Pro has completely replaced my laptop now as a productivity device. I did look at the iPad pro when purchasing my surface but it didn't solve any of the problems I was looking at - it really was/is just a bigger iPad with all the same limitations (and benefits). As I say though, a cheaper surface device would be welcomed by many, as long as there are not *too* many compromises along the way. I think MS knows its Surface products are not competing with iPad Pros, but they want to take a bite out of that market as well. MS realized that cheap tablets for basic usage (internet browsing, checking email, reading) is a money-making segment of the market and now wants to be there. Are they using MMC? UFS 2.1/3.0 is sufficiently affordable, compact, and fast. No reason they couldn't use it over MMC.